RUSH: The more things change, the more they stay the same. When this program began in 1988, global peace marchers were marching across the country and doing die-ins on the steps of Washington buildings. 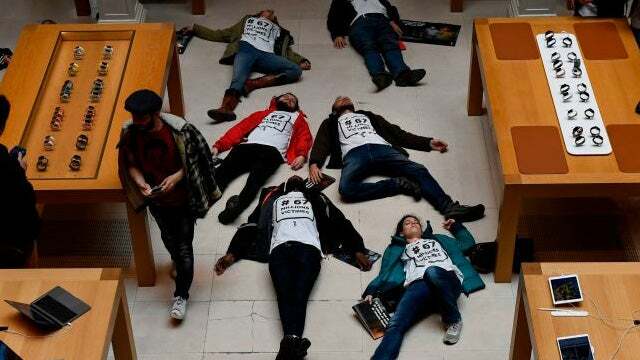 Well, activists have staged die-ins at French Apple stores to protest the lack of taxes that Apple is not paying. They’re actually walking into Apple stores and lying down on the floor and pretending to have died in there. RUSH: No, no, no, not kidding about this at all. Back in the 80’s, it’s where the great peace update came from, Slim Whitman, Una Paloma Blanca. I’m not kidding. There was something called the great global peace march, and its objective, of course, was to end and get rid of nuclear weapons. And it featured something called Harmonic Convergence. Do you remember what Harmonic Convergence was? Mount Shasta. You were supposed to go to the nearest mountaintop. Ground zero for Harmonic Convergence was Mount Shasta, it’s in Washington, and you go up there and you’re supposed to chant a mantra at the same time and do this all over the country, and that would create a vibe so powerful as to alter biorhythms and who knows whatever else and turn thugs and Republicans who love war into pacifists. That was the objective of Harmonic Convergence. So we could all be at one in peace, even for a fleeting moment just to experience it so that we might try to achieve it consistently. And then these people were marching coast to coast. They marched from California to Washington. They did it in waves. And when one group would get there, they’d go to the State Department, they’d go to Pentagon and they’d pour red paint on themselves and lie down on the steps and simulate the moment of nuclear detonation. Now, the fact is if they were anywhere near a nuclear detonation they’d be vaporized and they wouldn’t even be there, and there wouldn’t be any blood. But, of course, they did this, and we mocked it and made fun of it, and we kept track of their progress all across the fruited plain. And to show you how leftists just recycle everything, I’m reading my tech blogs over the weekend, and I find out that a bunch of activists are staging the same things, die-ins at Apple stores across Europe to protest — get this — the impact of tax avoidance on social services. “The Association for the Taxation of Financial Transactions and Citizen’s Action —or Attac for short —staged ‘die-in’ protests at two French Apple stores on Saturday, once again charging the company with exploiting loopholes to avoid paying its fair share of taxes,” thereby harming social services. Meaning, if Apple is not paying enough in taxes, then there’s not enough welfare, and there’s a picture here of a bunch of Looney Tunes in an Apple store simulating dying. There’s no red paint or blood here. They just have died. They’re on the floor of the Apple store. And this, of course, is supposed to raise consciousness, have everybody concerned that corporate entities are not paying their fair share.